You know I thought us Jews had the chicken soup thing locked down, so why is it the Italians get a shout out for their wedding soup? Well here is my version, with a slight twist to attempt to make it a little less calorie dense. I gotta drop my gut posthaste and this makes a quick, yummy and healthy dinner on a weeknight. PS: If you were paying attention to the recipe details in the credits, you’ll see I left out the egg. You’ll need it. I think “us” Italians make a better chicken soup than “you” Jews as well. Perhaps throwdown number two?? I will make it for sure… and definitely refer all of my friends to your channel! WAYYYY better than food network! Thanks for your support and comment Valerie. I checked out your site pretty quickly — very nice, will have to stop by later for some more serious browsing. Do you do the photography yourself? I am Norm’s dad and remember you from Yonkers. He touted me on to this site. Excellent!! You can bet I will pass it on. My wife and youngest son, Scott, also enjoyed immensely. The very best to you for a great success. I am going to try your recipe this weekend… it looks REALLY GOOD!! BTW – Nice Kitchen – especially your COUNTERTOPS!!! Keep those videos a commin!!!!! 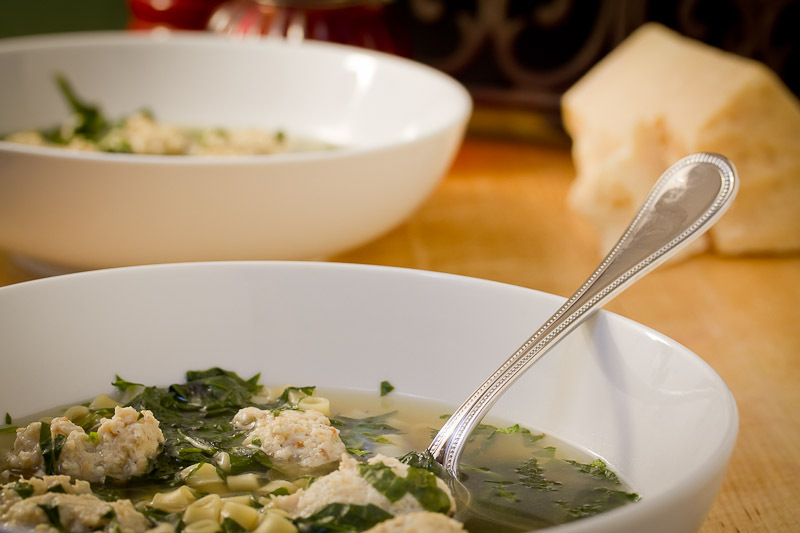 You and I must be on the same food wave length…Like Sunday Sauce, I made Wedding soup like you too.